Last night at Safeco Field could best be described as a parallel universe. There was Ichiro Suzuki taking his usual spot in his home ballpark in right field. Except he was wearing #31 and Yankee road grays, facing off against the only Major League team he'd ever played for. So after 9 years with the Orix Blue Wave (Japan Pacific League) and 11 full seasons with the M's, 17 total All-Star Games, 17 Gold Gloves, 9 batting titles, and 4 MVPs, Ichiro at 38 now takes on a new challenge. It will be the only time in his career where he isn't the centerpiece of a team. Some may say there go the Yankees getting richer again, but the trade makes perfect sense for both sides. The Pinstripes pick up a declining hitter (career low .261 avg) but a first-class baserunner and outfielder. He is expected to fill the role of LF Brett Gardner who's out for the season with an elbow, so the bar is set moderately low. The Mariners pick up 4 prospects since the team is going nowhere anyway, and get something for their aging star in the last year of his contract. Ichiro will bat in the bottom part of the lineup, play an unfamiliar LF and will sit against some lefties. Apparently he signed off on his new role before accepting the trade. And the timing was perfect as the Yankees realized they needed some tweaking after getting swept 4 straight in Oakland. 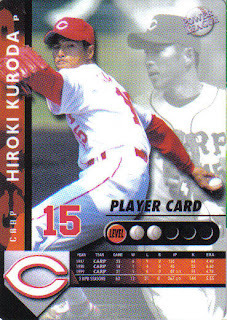 To make things even weirder this particular Monday evening, the winning pitcher in the Yanks 4-1 victory was Hiroki Kuroda, the 37-year old former star of the Hiroshima Carp of the Japanese Central League. After an inconsistent 4 years with the Dodgers and first month with New York, he is now pitching brilliantly. On top of that, A-Rod flashed some old Seattle muscle (7 years with M's) with a mammoth home run late. And then finally, the final out off the bat of former Yankee Jesus Montero landed in Ichiro Suzuki's glove in RF. There's always been sort of a mini-controversy as to how Ichiro Suzuki should be referred. The back of his jersey in Seattle said "Ichiro" instead of his proper surname. That issue is now off the table as neither the Yankees home nor road jerseys have names. That fits for the Yankees' newest outfielder, who will just be blending in.